London: 22 November 2018 - Urban Voices Collective and Bond string quartet have teamed up with celebrated composer David Arnold to release the finale song from this year’s #March4Women: the classic women’s rights anthem “You don’t own me” reworked by Arnold, in aid of charity CARE International. The song and video will be released on YouTube, Google Play and itunes on 23rd November, ahead of International Day of the Elimination of Violence Against Women. The song’s release comes a few days after the centenary of women first standing in Parliament, a few days before the centenary of the first women being able to vote, and towards the end of a year which has seen an enormous focus on gender equality issues. The sense that the women’s rights journey is far from over echoes far and wide. Urban Voices Collective and Bond first performed the song at CARE’s #March4Women rally in Trafalgar Square in March, a gathering of more than 10,000 feminists, led by suffragette descendant and gender equality campaigner Helen Pankhurst, to demand an end to sexual violence and sexual harassment in the workplace. The video features speakers from the day including Annie Lennox, actor Michael Sheen, presenter Sue Perkins, Bianca Jagger and Mayor of London Sadiq Khan. Proceeds from the song will go to CARE, whose work includes empowering women and girls worldwide, ensuring women and girls can exercise their rights and live a life free from violence. The video features women from various CARE women’s empowerment projects around the world. The song is beautiful – it captures the defiance, the verve and the solidarity that characterises March4Women, and the current movement for gender equality more widely. This version of “You don’t own me” acts as an apt soundtrack to the centenary year – a year that has shone the light on how much still needs to be done. The music is uplifting, the video makes you smile, and the proceeds from sales will go to support women and girls worldwide – what a wonderful combination. We performed this song at March4Women and it was clear from the incredible atmosphere that the song resonated with those who were there. We wanted to capture some of that energy and solidarity and channel it towards making change, that’s why we recorded this for CARE. It’s vital for men and boys to be part of the conversation around gender equality. Change happens when we all work together, and music is a powerful catalyst for change. This song in particular, originally sung by Lesley Gore in 1963, has become a popular anthem for equal rights. UVC and Bond more than do it justice with their distinctive and formidable sound. Urban Voices Collective and Bond have performed at some of the UK’s most high profile events, from the Olympic closing ceremony, to the Proms and the BAFTAS. The “You don’t own me” video was directed by Karl Willett with musical direction by Kalon Rae and produced at Air Studios by David Arnold. Urban Voices has been supporting CARE for the past two years – March4Women is a cause we care deeply about. They say that if music comes from the heart, it goes to the heart, and anyone who listens to our rendition of “You don’t own me” will know this to be true. 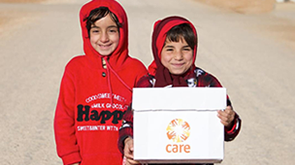 CARE International works in 79 poor and developing countries around the globe to save lives, defeat poverty and achieve social justice. We put women and girls in the centre because we know that we cannot overcome poverty until all people have equal rights and opportunities. Our programmes and our policy work tackle the underlying causes of poverty so that people can become self-sufficient. We place special focus on empowering women and girls because, equipped with the proper resources, women have the power to lift whole families and communities out of poverty. Known for their outstanding vocals and distinctive style, Urban Voices Collective have been industry favourites for over a decade, with countless performances supporting artists as diverse as the late George Michael, Demi Lavoto, Andrea Bocelli, Rita Ora, Take That and The Who. Urban Voices Collective cemented their place on the music scene performing to a global audience of 750 million viewers at The London 2012 Olympic closing ceremony. Other highlights include the MTV EMAS, The BAFTAS and The BBC Proms, The Paralympic closing ceremony with Coldplay, two UK tours with Diversity, The Royal Variety Performance, and performing the official anthem at the opening of the first ever Invictus games. Collaborations with the London Symphony Orchestra, acclaimed composers David Arnold and Tim Rice, Radio 1 Live Lounge for Sigala, backing vocals on albums for Paloma Faith, Plan B, and Sigma prove their extensive experience in both live and studio settings. Urban Voices Collective bring together the strongest and most adaptable vocal talent in London. David Arnold is a British film composer best known for scoring five James Bond films, Stargate (1994), Independence Day (1996), Godzilla (1998) and the television series Little Britain and Sherlock. For Independence Day he received a Grammy Award for Best Instrumental Composition Written for a Motion Picture or for Television and for Sherlock he, and co-composer Michael Price, won a Creative Arts Emmy for the score of "His Last Vow", the final episode in the third series. Arnold is a fellow of the British Academy of Songwriters, Composers and Authors. On the 19th and 20th  May 2017 Arnold hosted two concerts of his music in Dublin at the Bord Gáis Energy Theatre.